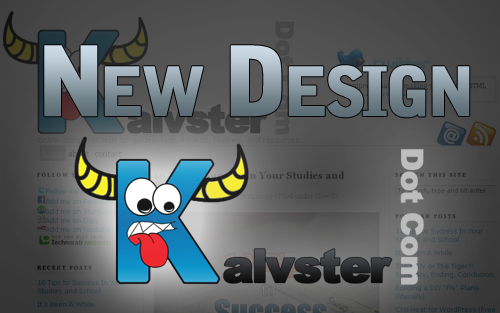 Welcome to the new design of Kalvster Dot Com. As you may have noticed, there were many drastic improvements. Feel free to take a look around and tell me what you think in the comments. Anyhow, here are the highlights of the new changes to this website. Yes, no more slow loading images and scripts. This website is now mostly based on CSS; no more slow loading times! That’s right, the excerpts will now be longer when browsing through the index page. Gives a better taste so you can decide to read it or not. I thought my logo should resemble my name more…so I created another one! I found this search plug-in to be highly inefficient. It slowed down the loading time of the website, so I uninstalled it. For now, the default search engine for the website will be used. My mobile blog before did not have any pages, but now the pages of my blog can be viewed in mobile too. That’s all for now. Just thought I would explain what changes there were.